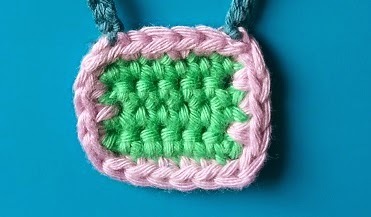 For this pattern you will need small amounts of different coloured yarn and the appropriate size hook. I used Rico Creative Cotton, which is an aran weight and a 5mm hook. You will also need a darning needle. The finished Hot Air Balloon measures approximately 12cm by 19cm but the measurements will vary depending on the yarn and hook used. 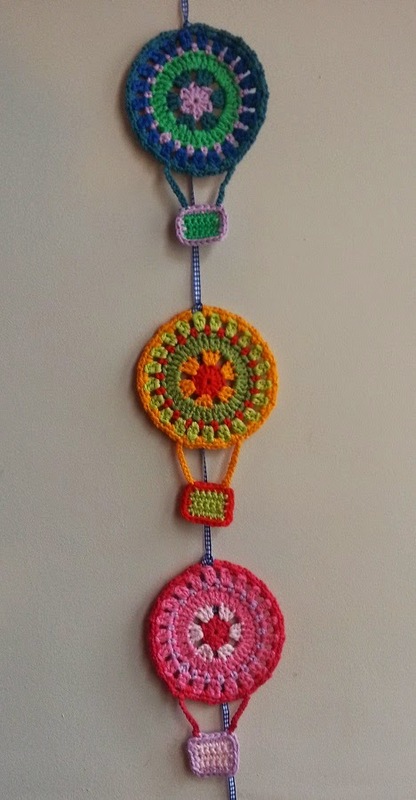 This pattern is written using UK crochet terms. The Chain 3 at the the start of rounds 1,2,3,5 count as 1 Treble. 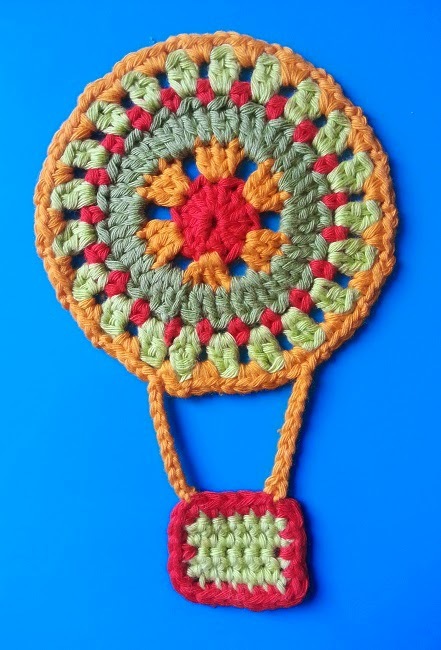 Round 1 - Make a magic ring and Chain 3, crochet 11 Trebles into the ring and join with a slip stitch into the top of the chain 3 at the beginning of the round. Fasten off. Round 2 - Join a new colour in the next stitch (to the left of the slip stitch just made) Chain 3, 2 Trebles into the same stitch as the Chain 3, Chain 2, Skip 1 stitch, *3 Trebles into the next stitch, Chain 2, skip 1 stitch* repeat this around 4 more times (6 Treble clusters and chain spaces made). Join with a slip stitch to the top of the Chain 3 at the beginning of the round. Fasten off. Round 3 - Join a new colour into the the same stitch that you made the slip stitch in from the previous round, Chain 3, 2 Trebles in the next stitch, 1 Treble in the next stitch, 3 Trebles in the Chain 2 space *1 Treble in the next stitch, 2 trebles in the next stitch, 1 Treble in the next stitch, 3 Trebles in the next Chain 2 space* repeat this around 10 more times. Join with a slip stitch into the top of the Chain 3 at the start of the round (42 Trebles made). Fasten off. Round 4 - Join a new colour in the same stitch that you made the slip stitch in from the previous round, Chain 1 and 1 Double Crochet (DC) in the same stitch, Chain 2, skip 1 stitch, *1 DC in next stitch, Chain 2, Skip 1 stitch* repeat this around 19 more times, (21 DCs and Chain 2 spaces made). Join with a slip stitch into the first DC made in the round. Fasten off. Round 5 - Join a new colour in the next Chain 2 space of the previous round. Chain 3, 1 Treble in the same space, Chain 1, *2 Trebles in the next space, Chain 1* repeat this around 19 more times (21 2 Treble clusters and Chain 1 spaces made). Join with a slip sttich into the top of the Chain 3 at the start of the round. Fasten off. Round 6 - Join a new colour in next chain space of the previous round, Chain 1, 2 DC in the same space, Chain 2 *2 DC in next chain space, Chain 2* repeat this around 19 more times (21 2 DC clusters and chain spaces made). Join with a slip stitch into the first DC made in the round. Chain 10 (this is one side of the chain that joins the balloon to the basket). Fasten off. To make the other chain that attaches the basket to the balloon, skip 7 DCs and reattach your yarn, Chain 10. Fasten off. Chain 7, Crochet 1 DC in the second Chain from your hook, 1 DC in the next 5 stitches, Chain 1, Turn. *1 DC in next 6 stitches, Chain 1 Turn* repeat this 2 more times (4 rows of 6 DCs made) Fasten off. 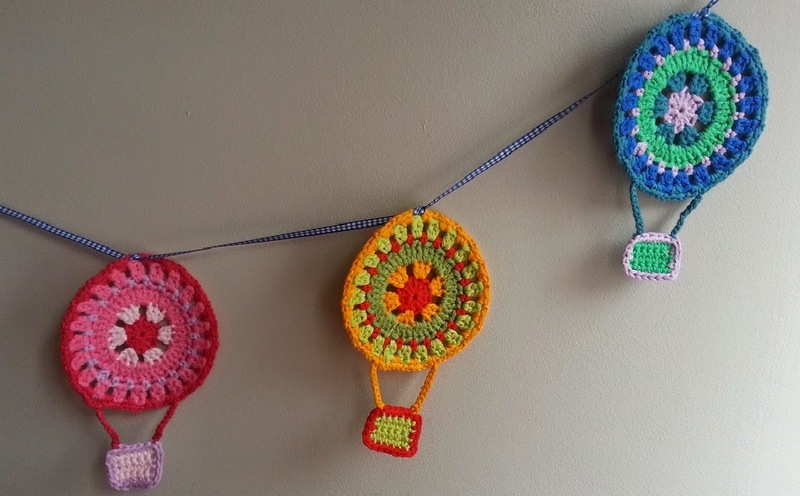 Attach a new colour into the slip stitch just made, Chain 1, Crochet 3 DC evenly down the side of the basket, 2 DC in the corner, 1 DC in the back loops of the foundation chain, 2 DC in the corner, 3 DC evenly up the other side, 2 DC in the corner, 1 DC in each stitch across. Join with a slip stitch into the first chain made. Fasten off. 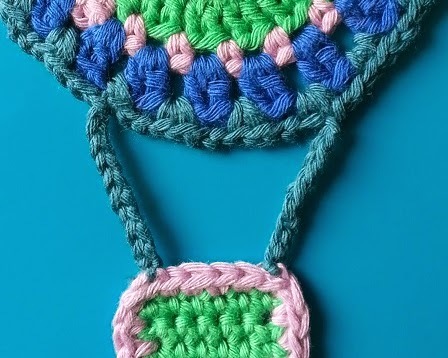 Attach the basket by sewing the tail ends of the chains hanging from the ballon to the top two corners of the basket. Sew in all tail ends and give the finished Hot Air Balloon Mandala a light press under a towel with the iron. For added strength you can paint the back with PVA glue as it drys clear. I was going to write this pattern as a full picture tutorial but my eyes have given up on me for today. If any one would like a full picture tutorial for this please post a comment in the section below. I do hope you have as much fun making these as I have had writing the pattern, do please, please let me know if you make one! Just having a go at this now I have a idea in my head to make hanging decoration for a little boys room .